Wall Leakage Waterproofing in buildings is common and it's necessary to understand the causes and measures to be taken for their prevention. Most of the building materials having pores within their structure in the kind of building block space, as for instance concrete, mortar, burnt clay bricks etc. expand on riveting wet from theatmosphere and shrink on drying. These movements area unit reversible, i.e. cyclic in nature and area unit caused by increase or decrease in inter–pore pressure with the wet changes, theextent of movement counting on molecular structure and consistency of the fabric. Building materials absorb the water from atmosphere or water flows over it and when thecondition of saturation, the flowing through the part of a building like walls, RCCmembers, roof terraces and daubing etc. takes place. We are providing the Best External Wall Leakage waterproofing Services in Hyderabad. Another reason for outpouring is theconsistency of the building materials once buildings area unit exposed to atmosphere; water absorbed by the materials step by step and resulted in leakage through roof terrace and walls exposed to theatmosphere. 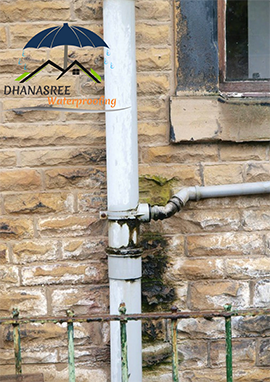 Leakage in buildings typically happens in walls, flat roof, and parapet wall and pitched roof etc. Each of on top of has been coated in this book and practicableness and general remedial measures in specific cases have been recommended. A damp building creates unhealthy conditions for those that occupy it. The metals employed in the development of the building are unsound. Unsightly patches are fashioned on the wall surfaces and ceilings. The decay of timber takes place quickly owing to dry rot in a damp or leaky atmosphere. The electrical fittings are deteriorated owing to moistness. The fabric used as floor coverings are seriously broken. 1. At First, we'll check the cracks and alternative damages to the outer wall surfaces and another space. 2. Initially, we tend to apply a water-resistant chemical coat to the walls of the surface from its foundation. 3. Then, we tend to apply the harm proof and protection layer to the walls with the trust-worth chemicals in our waterproofing business. Call +91 9700191890 to arrange a free Demo of your wall leakage problem. We are providing the best wall leakage Repair services in Hyderabad with 10 years of experience in wall leakage repair services.